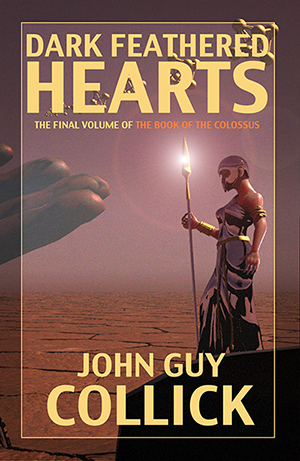 The Book of the Colossus is now complete with the final volume – Dark Feathered Hearts. Max and Abby race against time to find the Machine Men and stop the creation of a mad god who will destroy everything. Leading a rag-tag band of monsters, witches and exiles they make their way across an ancient wilderness shrouded in endless night. But in the centre of this desolation they come across one of their deadliest foes, and discover the true extent of the conspiracy against mankind. Only two choices remain, they can either set the Giants that will form the deity’s mind against each other, or they can risk everything on a journey to the very edge of their universe. Crysanthe spends her days hunting escaped mutants through the wood and canvas corridors of the Brittle Hag’s starship, trying to forget her past in the endless labyrinth. The vast landscapes of the craft have become her refuge, but the vessel is under attack from an unknown intelligence outside reality itself. The general and her Abhuman allies must survive long enough for her to beg the last alien gods to save humanity. The universe is empty. The stars are dead. The worlds are no more. The last humans struggle to create a god to save them from the utter end. In the shadow of this colossus Max Ocel rescues a beautiful stranger from the clutches of an insane giant, and sets in motion a chain of events that threatens to wipe out mankind itself. Invincible battleships bear down on the ancient city of Metacarpi. Assassins stalk the stone tower of his childhood. Alien creatures gather in the darkness. Max faces the realisation that he must sacrifice everything he holds dear to save humanity. 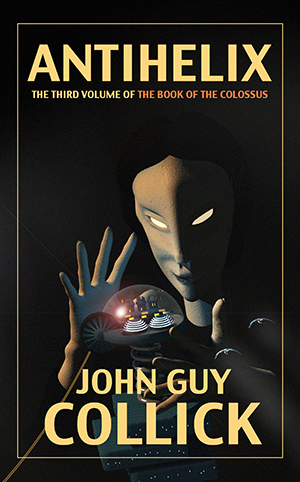 Thumb – the first volume in The Book of the Colossus, a gripping fast-paced science fantasy series of incredible imagination. Max and Abby are trapped in the city of Interosseous where the inhabitants navigate through the treacherous streets using the giant faces in the sky. 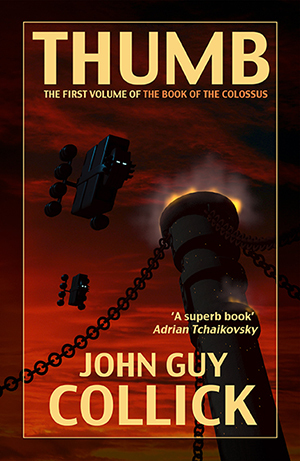 If humanity is to survive Max must contact the Machine Men who live in the Heart and Mind of the Colossus. But the way onward is a deadly maze peopled with lost creatures transformed by the darkness at the end of time. As Max tries to trace a safe path through the Body of God he stumbles across a pair of fugitives, and finds himself caught in a web of betrayal and conspiracy that ultimately threatens to destroy the last remnants of mankind. 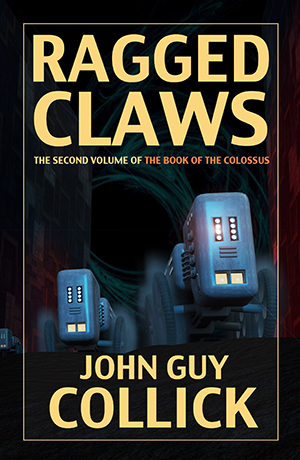 Ragged Claws is the astonishing sequel to Thumb and the second volume of The Book of the Colossus, a gripping fast-paced science fantasy series. Remorseless, vicious and brilliant – General Crysanthe Uella has dedicated her life to ensuring humanity will escape from the embers of a dead universe. But the corrupt lords of a decaying empire have betrayed her, tearing away everything and everyone she ever cared for. She has one last chance to redeem herself – a final mission far to the east, in a realm filled with rumours of a madness that consumes entire cities. Reluctant rulers of a race of monsters, Max and Abby finally possess the technology to carry them deep into the kingdom of the Machine Men. To do so they must first pass the AntiHelix, an immense fortress citadel inhabited by a civilisation ancient, decadent and cruel whose agents are even now hunting them down. AntiHelix is the sequel to Ragged Claws and Thumb and the penultimate volume of The Book of the Colossus quadrilogy.